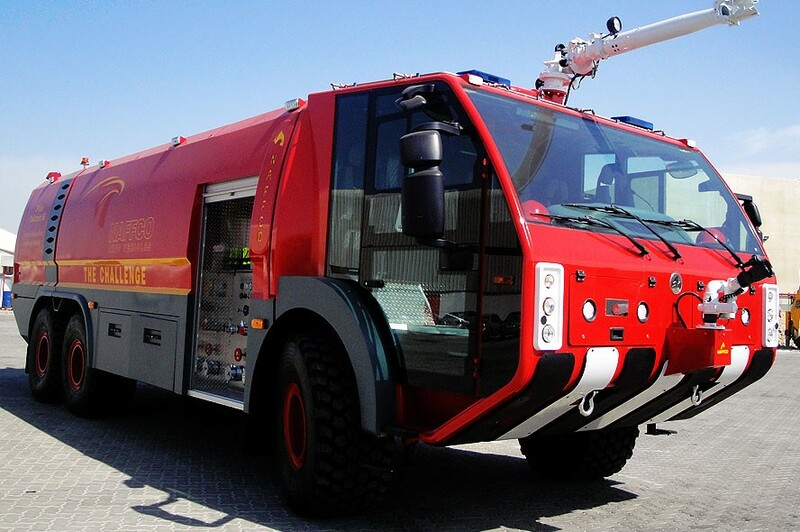 The “Fire Falcon 6”, a 6x6 vehicle, is specially designed for modern fire fighting operations on major airports and built according to the requirements of NFPA 414 – 2007 and ICAO Doc. 9137-AN/898 Part 1 – 1990. It meets or exceeds the mandatory automotive and fire fighting performance requirements for a major foam tender. The basic chassis of the “Fire Falcon 6”, FRESIA F800, is designed exactly for the purpose of ARFF vehicle; it is neither a military vehicle nor a commercial vehicle converted into an ARFF vehicle. The chassis has specifically designed axles rather than “standard” adapted axles with real 3 m width (not off-set rims) to increase the stability at the rated capacity of each axle. The chassis is fitted with a high performance rear mounted IVECO VECTOR diesel engine having a total power of 1,023 HP which is considered the highest and most powerful engine available in the market in the 6x6 category with over 300 HP more than any other competitor. This huge engine together with a fully automatic ALLISON transmission allows an unmatched acceleration of 0 to 80 km/h in less than 23 seconds and a top speed of 120 km/h – both at a fully loaded vehicle (around 36 tons). It provides, as well, good cross country and braking performance when operating within a temperature range of -25º to +50ºC and relative humidity up to 100%. Other than the two branded items (engine and transmission), all components of the chassis are in-house engineered, rather than assembled, to guarantee constant supply of spare parts for a long period of time. The design of the chassis, cab, superstructure, and tank assembly will provide a low centre of gravity ensuring very good vehicular stability. The cab is made of stainless steel with huge glass surface which results in providing a high level of corrosion resistance. The design of the cab provides a high level of crew protection, comfortable working environment, excellent visibility and ease of operation for the crew members. .The low noise level in the cab is achieved additionally by good insulation and the rear engine configuration. The vehicle has a high capacity GVW (gross vehicle weight) of 36 tons to allow for maximum loads of extinguishing agents and equipment. This is achieved as well by usage of light material in construction: water/foam tanks made from polypropylene and superstructure made from aluminum. Six under truck protection and ground sweeping nozzles. The system has also a 225 kg dry chemical powder system complete with an electric rewind hose reel assembly fitted with 1” x 30 m hose and gun of 2.5 kg/sec capacity. The water pump is operated through a PTO mounted torque converter which allows pumping of water or foam solution while the vehicle is moving (pump-and-roll operation) at any speed. The vehicle is also provided with large volume storage lockers on both sides of the superstructure suitable for the stowage of all fire fighting and rescue equipment as recommended by ICAO standard. Other features include full stainless steel exhaust, cantilever spring mounted suspensions for added high speed capacity handling, pushing fan cooling for higher engine cooling and disc brakes with special calipers to assure constant stopping.